At UN, As Amos On Leave from House of Lords, Co-Brit Williams Goes for DPA of Ban Ki-moon, Waiving UN Charter? UNITED NATIONS, August 17, updated Aug 18 -- The UN has among its high officials at least two members of the UK House of Lords, Inner City Press has learned: humanitarian chief Valerie Amos and Lebanon envoy Michael Williams, who sources say may be seeking an even higher post. The UN charter clearly prohibits a UN official serving any government or other interest other than the UN. Under Ban Ki-moon, this has in effect been waived for example for Ban's envoy to Libya Al-Khatib, who remains a Senator in Jordan. Al-Khatib has told Inner City Press he is not paid by the UN; other sources said a different "fix" or loophole had been found for Amos and Williams. On August 16, Inner City Press asked Secretary General Ban Ki-moon's acting deputy spokesman Farhan Haq to "please describe the UN's thinking and position on whether the UK titles / honors of Michael Williams and Valerie Amos may violate the letter or spirit of the UN charter." Haq's written answer -- he had canceled the day's noon briefing, apparently on the argument that with Ban working from home, there was less or no UN news -- strangely addressed only one of the two: "No, they do not. Michael Williams is on a leave of absence from the House of Lords while he is working for the UN." But why not answer as to Amos? See below. On August 17, Amos appeared in the UN briefing room to talk about Somalia, Syria and Sudan. As the penultimate question, Haq called on Inner City Press, which after Sudan asked Amos, since Haq had declined to answer, about her service in the House of Lords. "Yes, I am formally a member of the House of Lords," she said, adding "they have something called Leave of Absence and I have take it, I think I'd have to given three months notice to go back." Video here, from Minute 28:50. It is understood that when the UN Office of Legal Affairs questioned Michael Williams about his recent peerage and membership in the House of Lords, the case of Valerie Amos was brought up and cited to. The "on leave" loophole has been opened. Other sources say that Williams, always genial with the press, is under consideration by the UK Foreign Office to be nominated at a UK candidate to replace American Lynn Pascoe as the head of the UN Department of Political Affairs. As Inner City Press exclusively reported, Pascoe has told other high US officials he wants to leave the post. The only question is whether the Obama administration would like to put another American at DPA, or take over the UN Department of Management (with Patrick Kennedy, sources say) and perhaps also Ban's chief of staff position. So is it Williams versus Amos, Lord versus Baroness? Both are associated with the Labor party -- Amos waits with Ban Ki-moon when Tony Blair visits the UN -- and officials of Foreign Office under Conservative David Cameron are apparently nonplussed by the idea of nominating Williams. We'll see. - This is also to ensure that absentees aren't included in the numbers for voting." UNITED NATIONS, August 16 -- When the UN on Friday, August 12 announced it would on Monday start cutting daily noon briefings by 40%, despite events in Syria, Sudan and Libya, and Inner City Press asked if this was an attempt to cut costs, Secretary General Ban Ki-moon's acting deputy spokesman Farhan Haq replied, "I have been here as a Spokesperson for 12 years, and every summer...there are times when we cut back on briefings." Transcript here. The claim that this cut back takes place "every year" was repeated, along with Inner City Press' question to Haq, "How did you decide to say that journalists here want less information rather than more?" Beyond the fact that the (Arab) Summer of 2011 might be different than past summers, what with Ban Ki-moon supposedly coordinating military action in Libya under Security Council resolution 1973, Inner City Press has gone back to the UN's archive of noon briefing transcripts for the past ten years and found that only in 2009, under Ban's previous spokesperson Michele Montas, were some briefings canceled in August. See links below and online here. Under Kofi Annan, since at least 2001, daily briefings were held in August, by his spokemen Fred Eckhard and Stephane Dujarric, who is still with the UN. 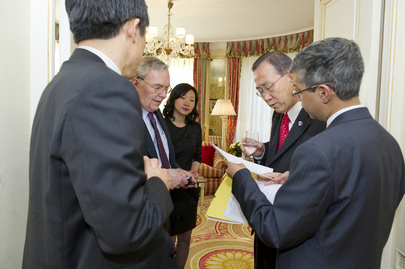 Then under Ban Ki-moon and Montas, in 2009, briefings in August were reduced to Monday, Wednesday and Friday. Even in 2010, under Montas' successor Martin Nesirky, briefings were held daily in August. Now in 2011, with Nesirky out from now until the end of August, his deputy Farhan Haq announced on August 13 that briefings would be reduced -- and said it had always been this way. But see archived daily briefings links, and below. And so on August 16, as rebels closed in on Tripoli assisted by NATO's -- Ban Ki-moon's? -- air strikes and the news was full of war crimes in Southern Kordofan amid inaction by UN peacekeepers and of killing in Syria, there was no noon briefing. Inner City Press submitted some questions to Haq by e-mail, copying Nesirky. On whether Ban's post-Gaddafi adviser on Libya Ian Martin could brief the press and how large his UN funded team is, there was no answer. Likewise on a briefing by departing UN Controller Jun Yamazaki, no answer, not even a date by which the UN's top budget official will leave. (His job has already be advertised in The Economist.) 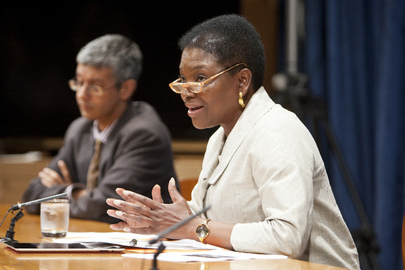 No answer on a question about top UN humanitarian Valerie Amos. On a question about Darfur in Sudan, Haq said only "check with DPKO." On a job Ban Ki-moon gave out to Samuel Koo while in South Korea, Haq said ask UNEP -- Inner City Press has, and there has been no answer. And so it goes at the UN -- but note, unlike Haq's claim that it has always been this way, it has not. It is getting worse.